When you are thirsty, how long does it take for you to get a drink of water? Drinking water, like breathing air, is necessary to stay alive. So to stay alive, you do what you have to to get some water. Would you walk three hours for water? 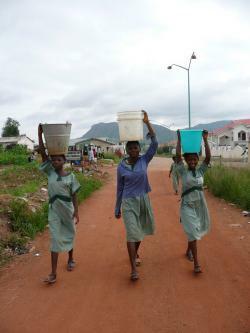 In Africa alone, people, usually women and children, spend 40 billion hours every year just walking for water. Once, when I ran out gas I tried carrying 5 gallons of gas to my car. My arm sockets ached so bad after a quarter mile that I considered pouring half of it out. Five gallons of water weighs 40 pounds. No way I would carry it on my head (an old neck injury would really flare up). I know that carrying that water is causing neck, back, and arm pain. Some charitable organizations are hoping contributions can be used to provide relief to those needing easier and safer sources of water. With safe water nearby, women are free to pursue new opportunities and improve their families’ lives. Kids can earn their education and build the future of their communities. They figure that "every $1 invested in improved water access and sanitation yields an average of $12 in economic returns, depending on the project." charitywater.org.